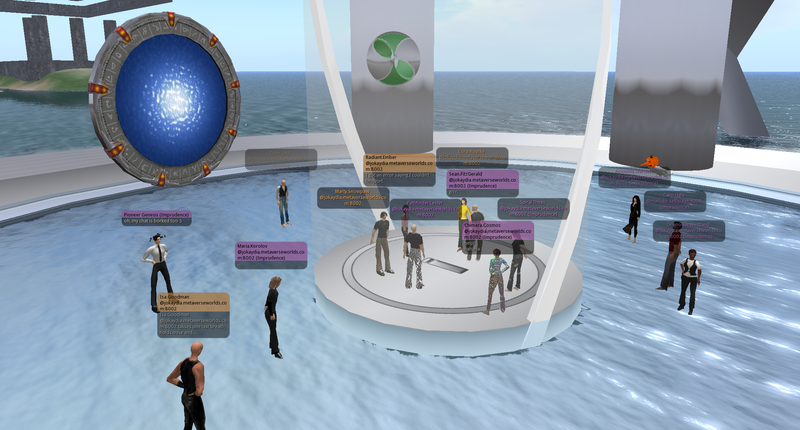 The first half of the meeting was spent introducing ourselves to each other and discussing everyone’s various virtual world projects as well as the current state of the Hypergrid. For the second half of the meeting we went on a group tour of the Hypergrid, making jumps to 3 different grids. 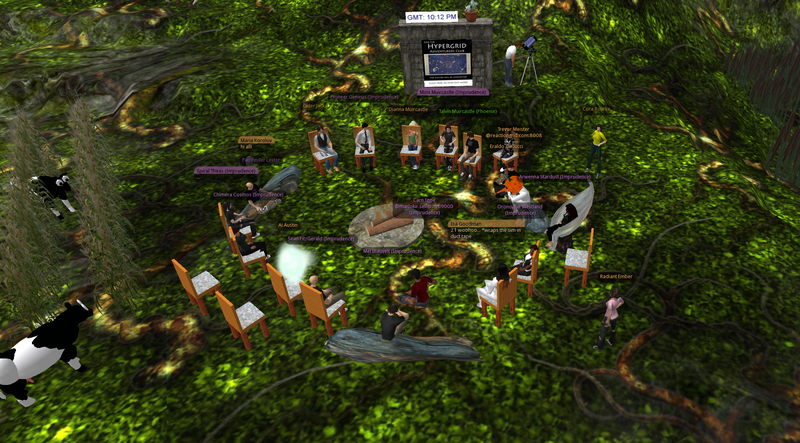 It was a wonderful group of pioneers, all very friendly and all doing amazing things in virtual worlds. The tour was a real adventure, too. 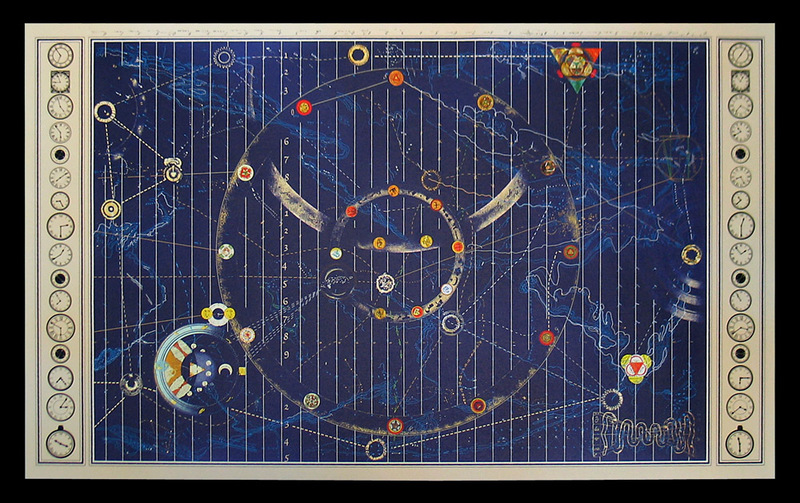 I really felt like we were exploring the universe using the Map in the movie Time Bandits. Read on for a full transcript and pics of our adventure. You’ll learn more about how the Hypergrid works, hear about cool new projects underway in Opensim, and I think you’ll agree that our final tour destination is one of the most beautiful regions you’ve ever seen on any grid. There’s even a mermaid prize at the end! You can also follow our club’s tweets at #HGAC. 24 people attended our meeting. Two of them (Carn and Trevor) were Hypergrid visitors from other grids. We begin on the island of Pathlandia on jokaydiaGRID. Ai Austin: Pathfinder, do you want to use #HAC or #HGAC as suggested on Twitter? Cider Jack: chairs from nowhere! Talvin Muircastle: Wait…this place has the Cornfield, too? Pathfinder Lester: Talvin, a mini one, yes. Talvin Muircastle: Jokay wouldn’t DO that to us! Dianna Muircastle: She may save it for the students. Talvin Muircastle: Children of the Corn? Ai Austin: It will help to have the twitter tag agreed before everyone gets here? #HAC or #HGAC or something else pathfinder? Pathfinder Lester: FYI, Talvin made a really handy clock that always displays the current time in GMT. I put it over the kiosk so it’s easier for folks to figure out the converstion between GMT and their own local time. Pathfinder Lester: that way there will be no confusion. Pathfinder Lester: I updated my blog page to reflect that, too. Talvin Muircastle: It should be copyable. Pathfinder Lester: that’s great. thanks Ai. Mimi Muircastle: Hi Path and all of you! Talvin Muircastle: I am going to get a screenshot for Jokay. Spiral Theas: How are you? Mimi Muircastle: great! good to see you! Pathfinder Lester: nice. 16 people here. Talvin Muircastle: There, that should do it. Pathfinder Lester: ok, I’ll kick things off. thank you all for coming today. I’m very excited about this club. Pathfinder Lester: I’ve been just beginning to explore the hypergrid, and I’ve been having a lot of fun exploring different grids. Pathfinder Lester: I thought it would be fun to get a group together to share experiences and tips with each other. Together, we can help each other learn a lot. Talvin Muircastle: Clan Muircastle over here. Amusing. Cider Jack: I want a window seat! Pathfinder Lester: To start off this group, I thought it would be good to go around the circle and briefly introduce ourselfs to the group. Why don’t we move clockwise from me. Rob, want to introduce yourself? Talvin Muircastle: Well, Dianna and I are married, so I guess you are my cousin. Pathfinder Lester: Rob must be afk. Cider, want to introduce yourself? Pathfinder Lester: Pioneer, you’re up. Talvin Muircastle: Jokay: grabbed a few shots for you already. Chimera Cosmos: Spiral and I are doing a meeting on skype to talk about our other “several” projects so kick me if I miss my turn! Pathfinder Lester: you’re right. 20! Pathfinder Lester: Pioneer, yeah, your arctic region is really coming along nicely. Ai Austin: Where are we on intros? Pathfinder Lester: no worries Mimi. Dianna Muircastle: I’m Dianna. I’ve ben here for a couple weeks now. I’m totally blind. Jokay Wollongong: and yay Mimi… thanks for coming to play with us! Dianna Muircastle: Having a lot of fun, too. Been in sL a bit longer. Pathfinder Lester: Great to have you here, Diana. Talvin Muircastle: I am here to do constructive work, since there are no people named “Linden” for me to argue with. I specialize in scripting, making tools that are useful to educators and accessible to people with disabilities, and when finances straighten out, we’re going to open Callahan’s Crosstime Saloon here. Talvin Muircastle: But not an RP area. Cider Jack will have to look up those novels…. Trevor Meister: so Cora… or Eraldo…are you up next? Talvin Muircastle: Now I am convinced this is not SL. We have over 20 people in here and chat is not lagging. Chimera Cosmos: I’m from Washington U in St. Louis. I’ve been in SL since Nov 2006 and doing edu stuff since 2007. Spiral and I are partners in crime since 2008. Pathfinder Lester: in the interest of time, why don’t we all just type in a brief introduction of ourselves. easy to lose track of where we are in the circle. Spiral Theas: Hi everyone. I’m Spiral Theas. Chimera Cosmos and I are collaborators (and friends). I’ve just arrived here on JokaydiaGRID this week. We are the owners of “Sagacity” and look forward to collaborating with you all. Ai Austin: Hypergrid locations need auto update and reporting mechanisms. Arwenna Stardust: *gives thanks for a chat log 🙂 so much good info here! Trevor Meister: I am a former teacher from Edmonton Canada, now working as a developer, SL for 4 years on Reactiongrid for 2. Also interested in educational tools…ie imported Scratch4SL into Opensim and working on modding it to have inworld interface..
Sean FitzGerald: I did a lot of work with jokay on education in SL a few years back… been out of the loop since then… Opensim really seems to have matured in my absence, so I’m back again, excited with a pioneering spirit. Jokay Wollongong: THanks Maria with a big Woot for all the hard work you do to make the hypergrid useful to all of us! Pathfinder Lester: wow, what a great group of folks. I’m especially excited that Maria is with us. Her websites are the best place to learn everything you need to know about the hypergrid. Sean FitzGerald: indeed… Maria is the best opensim promoter! Talvin Muircastle: And a horse. Arwenna Stardust: and a few ducks? Pathfinder Lester: we were just introducing ourselves to the group. would you like to introduce yourself? Pathfinder Lester: and anyone else who just arrived. please just introduce yourself in open chat. Arwenna Stardust: oh and don’t forget the mermaid! Maria Korolov: trevor: I see you were able to hypergrid over here from RG — I couldn’t get it to work. where did you jump from? Pathfinder Lester: Talvin, so far so good. but i’ll need more chairs that’s for sure. Delia Lake: hi everyone. I’m Delia Lake. this is my first visit to jokaydia. I’ve been in SL for over 4 yrs though. Pathfinder Lester: Trevor brings up an important thing. When jumping around the hypergrid, you cannot always go directly to your final destination. Pathfinder Lester: You often have to make temporary hops. Pathfinder Lester: Maria, that’s because of the way the grids are laid out, right? Could you explain it briefly why that’s the case? Maria Korolov: yeah, LOTS of ways hypergrid can go wrong. it feels a lot like very early Internet, when pages often failed to load. Isa Goodman: what is the 4096 region bug? Maria Korolov: ai: lots of versions of opensim are incompatible with each other, or work in only one direction! Pathfinder Lester: I’m going to pass out a notecard while Maria talks. Once you’re on FunGrid, open the world map and tp to the region “*Aqualand*” That is our final destination. There’s a freebie mermaid hidden in the region. Everyone can pick up a copy as a souvenir of our first tour! Cora Rourke: so we need to set a home point? Ai Austin: thats a REAL pain… the same coordinmate issue! Maria Korolov: a viewer issue — the oopensim developers can’t do anything about it! Pathfinder Lester: I think i got everyone. if you didn’t get a notecard from me, please IM me. Ai Austin: I though one viewer purported to have fixed it? But I thought that odd. anmyone know? Pathfinder Lester: personally, i find it kind of fun trying to discover routes. Pathfinder Lester: someday it will be a lot easier. but for now, we’ll manage. and hopefully have fun while we do. Arwenna Stardust: and then we will reminisce about the good old days! Pathfinder Lester: in the notecard I gave you I’ve mapped out a little tour and some other info. Ai Austin: is the plan to go to those locations now Pathfinder? Pathfinder Lester: Ai, not right now. Pathfinder Lester: first, everyone needs to make sure they have a home location set. and that they’ve relogged since they set their location. Ai Austin: Are they all 0.6.9 HG1.0 locatiosn? Pathfinder Lester: Ai, I’m not sure. Radiant Ember: okay so we are setting our home to here? Maria Korolov: i like it. Radiant Ember: and then relogging is that right? Ai Austin: lost in hyperspace! Radiant Ember: Now log out? Oronoque Westland: so if I already had home set I am ready? Pathfinder Lester: Oro, I believe so. Trevor Meister: This sim is hypergrid enabled? Pathfinder Lester: but if you want to be super safe, just set your home region for Pathlandia for now. Ai Austin: I think te home locatyion set issue is only to let you get back isn’t it maria? Ai Austin: And the locatiosnn MUST be within 4096,4096. Did you design the tour that way pathfinder? Maria Korolov: ai: i know, it makes no sense. one of those weird bugs! Pathfinder Lester: Ai, i just designed the tour so it worked. I’ve tested it jumping from here. Pioneer Genesis: can we get the stargate thingies with full permissions from somewhere? Delia Lake: and when i relog it’s best to come in through imprudence? Pathfinder Lester: As Maria said, the easiest way to jump is to open the world map and type the hypergrid address into the search box to the left of the search button. Pathfinder Lester: and you’ll see the map move to the locatoin. Ai Austin: if you type it here as a sceonflife://gridname:port:regioneveryone can just click on it? Pathfinder Lester: Ai, i don’t know. Pathfinder Lester: And remember, you inventory will always be with you as you travel. Trevor Meister: Are we go to launch? Pathfinder Lester: is everyone good to go? Jokay Wollongong: I”ll be here at jgrid to field any support needs..
Pathfinder Lester: so type “jokaydia.metaverseworlds.com:9010” in that box next to the search button on the world map, click search, wait for map to stop moving, then click Teleport at bottom of map page. Ai Austin: forget that.. it fgailed to accept teelpiort by that mechanism.. use the map as pathfinder suggested. Pathfinder Lester: see you all hopefully on Aqualand! Spiral Theas: woooooot! I made it! Pathfinder Lester: i see the birdbath! Pathfinder Lester: which means you can take stuff out of it to rez on other grids. or collect things from other grids that you buy or that are freebies. Pathfinder Lester: and you’ll notice that the tag over your avatar has “@jokaydia.metaverseworlds.com” in it. that shows your home grid location. where your account and inventory live. Pioneer Genesis: how about for instance G$ currency, would that transfer over between HG jumps? Pathfinder Lester: Maria, thanks. Good to get that clarification. Pioneer Genesis: maria, so theoretically you would have it with you if you are using the same name in different grids? Isa Goodman: and if u dont have that over your head? Pathfinder Lester: cool spider, Trevor! Radiant Ember: just do the same thing huh? Spiral Theas: Wait, let me get my dramamine. Maria Korolov: drat, the second life URL didn’t go blue… i can never get the hang of that! Maria Korolov: radiant: does what? Ai Austin: Phew … got through. Radiant Ember: how do we get home? Radiant Ember: Just hit home? Spiral Theas: this is pretty darned col.
Ai Austin: no. we are not.. okay now. Pathfinder Lester: if things get really weird, just quit and start over with the jumps. Maria Korolov: pathfinder: it’s coming up for you ok? Ai Austin: lower left pathfinmder? Maria Korolov: ahhh — there’s an * in the name! Spiral Theas: Just looking for Aqualand….is that where we’re going next? Maria Korolov: copy and paste WITH the asterisks, folks! Pathfinder Lester: she is a freebie. Ai Austin: ah.. a real mermaid eh pathfinder! Pathfinder Lester: you can take a copy of her. just be sure to feed her. Pathfinder ventures out alone to find the rest of the group. They have discovered a hidden nightclub and are all dancing. Cider Jack: get out on that dance floor! Pathfinder Lester: you found the club! Cider Jack: THROW YOUR HANDS IN THE AIR, Y’ALL! Arwenna.Stardust: awesome Pathfinder – nothing like a party on a Monday morning! Chimera Cosmos: and how do we go back to Jokaydiagrid? Pathfinder Lester: Chimera, well, is your visa up to date? cause you won’t pass customs if it isn’t. Maria Korolov: pathfinder: congrats on finding a route that worked reproducibly for a large group of people! Jokay Wollongong: I agree maria… steller work path! Arwenna Stardust: yes Pioneer me too! Pathfinder Lester: i found this region last week. so beatuiful. i wanted to share it with folks. Maria Korolov: pathfinder: you mentioned mermaid outfits? Isa Goodman: so can it be LM’d? The group heads back to the mermaid on the pier. Pathfinder Lester: Jokay, thank you so much for all your work on jokaydiaGRID. your work made this whole club possible. Pioneer Genesis: sim FPS here is over 55, how often would you see that in SL? Maria Korolov: so is anyone here new to OpenSim? Arwenna Stardust: I never see that in SL! Jokay Wollongong: awww.. i just noticed the moon up there.. too cute! walkways and amazing organic things everywhere. Pioneer Genesis: wow, there is an area below it all, the mermaid shrine, it looks AMAZING! Pathfinder Lester: well, not really chat much. he only speaks german, and my german is bad. Trevor Meister: just about everything here is a sculptie…. Trevor Meister: Only 2500 prims used…. Pathfinder Lester: can you imagine what KenWooD Kish will make once mesh comes to Opensim? helped translate between KenWooD and myself. Pathfinder Lester: yes, she took me on a tour. she’s wonderful. Pathfinder Lester: so do you folks like the format of these meetings? I have 2 of them scheduled each week at recurring days/times. Pathfinder Lester: cool. i’ll stick to that format for now then. Trevor Meister: After a while might want to do a session where small groups go out on recon and report back. Pathfinder Lester: Trevor, that’s a great idea. Pathfinder Lester: oh wow, that would be perfect. Maria Korolov: and latest version of imprudence has Qarl’s new prim alignment tool! Pathfinder.Lester: and ty for putting up that page and all your tweets! Trevor Meister: Now to plot a path back home…..
Isa Goodman: do we just reverse the jumps? Pioneer Genesis: how about instant messages by the way, does that work across HG? Pathfinder Lester: so i’m going to log out. take care everyone, and I hope this was fun. looking forward to doing it again soon! Pathfinder Lester: until the next Hypergrid Adventurers Club, may your hypergrid jumps be clean and your inventory dry. So ends the first excursion of the Hypergrid Adventure Club! ADDENDUM: Chimera Cosmos took some great pictures of the tour. And Robin Heyden wrote a nice summary of the meeting on her blog. This entry was posted in Avatars, Hypergrid Adventurers Club, OpenSim, Virtual Worlds and tagged HyperGrid, Hypergrid Adventurers Club, OpenSim, pioneers, virtual worlds by John "Pathfinder" Lester. Bookmark the permalink. ah, you had Maria in your group! she is a gem and a veritable guru of all things OpenSim! This was fantastic – and encouraging reading. Many thanks. It is nearly impossible for me to join you, but this transcript and associated images are the next-best thing. Hope to try some Hypergrid jumps soon! Perhaps I may meet some of you then? Special thanks to Pathfinder. Unfortunately i couldnt be a part of this journey, but i was able to reproduce it thanks to the script! Worked like a charm (once you set your home 😉 )… I also met Pathfinder (what a fitting name, btw…) on his island and we had a short but great conversation. Hoping to be part of the adventurers club soon! So sorry that I was unable to attend the first Club meeting. It looked like a fun learning experience. Thanks for the transcript and summaries… great reading the comments during the adventure!!! The Hypergrid Adventurers Club is an awesome idea! Hope to be at the next meeting.